Cristina Moniz was busy as usual one morning three years ago, getting her children up for school and preparing breakfast for them and her husband, Joaquim Lopez, a police officer in the Timor-Leste district of Covalima. She passed by her 7-year-old son Deonizio’s room, and to her surprise, he was still in bed asleep. Approaching his bed, Cristina discovered that Deonizio had a fever. Cristina and Deonizio (with his youngest brother) spend time at their home in the Covalima district. It turned out that Deonizio had malaria, one of the deadliest diseases in the developing world, especially for children. He and Cristina first went to the village health post, Salele Community Health Center, which referred Deonizio to the hospital, where he had a blood test analyzed. Cristina was shocked that her son had malaria, but the health center’s staff advised her to give Deonizio anti-malarial medication on time and keep the home clean and mosquito-free. This isn’t an easy task for Cristina, who now has five children and many duties. But insecticide-treated bed nets that arrived from ChildFund in 2011 have helped. “Before getting the bed nets, there were many mosquitoes around the house,” Cristina says. “We are happy because there are no more mosquitoes, no more sickness. Now, my family and I can sleep safely away from mosquitoes. No more malaria in our family. Deonizio can go to school any time,” she notes. Deonizio and his baby brother are protected by a mosquito net. Having recognized World Malaria Day recently, we’ve learned about how many children are at risk of contracting this preventable disease in developing countries like Timor-Leste. Malaria kills 200,000 children worldwide each year, and many more become sick. However, the gift of a medicated mosquito net can mean good health, education and fulfilled potential for children in need like Deonizio and his brothers. I magine a world without mosquitos. Some scientists believe we could eradicate them without disrupting the ecosystem, and experiments to that end are underway. Why? Because every minute, malaria takes the life of an African child. That’s an important fact to remember as we mark World Malaria Day. A parasitic illness spread by female Anopheles mosquitos, malaria is the leading cause of death in children under the age of 5 in Africa. Every year, malaria kills 10,000 women and 200,000 infants worldwide. It’s especially dangerous during a woman’s first and second pregnancies. Infants become vulnerable again at 3 months, when the natural immunity they shared with their mother begins to wane. Mosquitos bite mainly between dusk and dawn, and they carry four different parasites. The most lethal — and most common — malarial parasite is Plasmodium falciparum. Anopheles mosquitos in Africa have long lifespans and prefer to bite humans rather than animals. As a result, 90 percent of all malaria deaths occur in Africa, although India also has a significant problem. The Gambia, Guinea, Liberia, Senegal and Sierra Leone, all countries served by ChildFund, have the highest occurrence rates in the world. Rainfall patterns, temperature and humidity affect mosquitos, so malaria infections peak during and immediately after rainy seasons. Epidemics occur when climate conditions change or when seasonal workers, immigrants or refugees lacking immunity move into malarial areas. Approximately half of the world’s population is at risk of catching malaria. In endemic areas, adults develop partial immunity through many years of exposure and illness, so most deaths occur in young children. In regions with lower infection rates, a sudden epidemic can decimate the population. Mozambique and Zambia have high rates of cerebral malaria — which virtually guarantees death — as well as co-infection with HIV. More than 90 percent of their populations are at ongoing risk for malaria, and more than 10 percent have AIDS. Existing HIV infection increases the risk of malaria and also the severity and complexity of the illness; HIV infection also interferes with the medications used to treat malaria, making death more likely. Malaria also increases the risk of mother-to-child transmission of HIV. Malaria is closely linked to poverty: The lower a country’s gross national income, the higher its malaria mortality rate. For children under 5, parasite prevalence is worst in poverty-stricken, rural communities, where lack of access to health facilities, effective diagnostics and treatment options is commonplace. Poor-quality housing offers little protection against mosquitoes, and the cost of insecticide-treated bed nets and indoor spraying with insecticides is challenging for those living on less than $1.25 a day. To avoid malaria, families need to sleep under insecticide-treated nets nightly, and houses must be sprayed every three to six months. 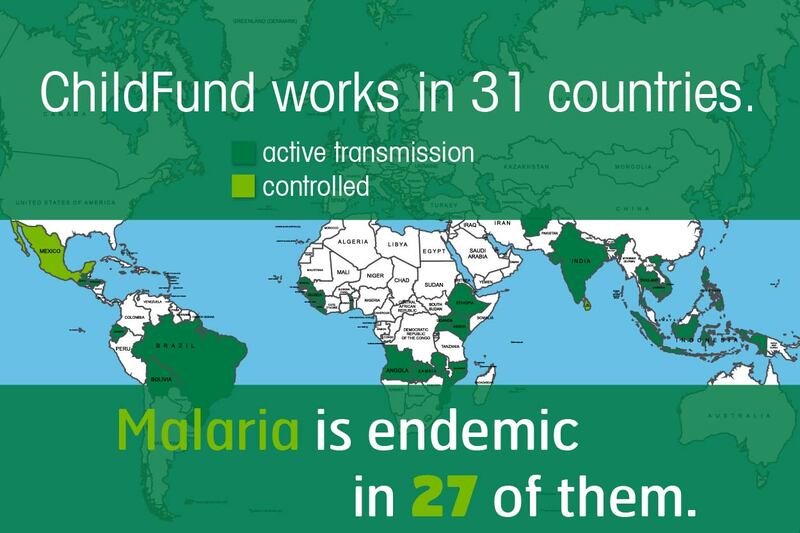 ChildFund is working to combat the spread of malaria in Guinea, India, Kenya, Liberia, Mozambique, Sierra Leone, The Gambia, Uganda and Zambia, and you can help by purchasing bed nets for children and families. On World Malaria Day, let’s strike back against this threat to children. View a video to hear a mother in Guinea describe how her children’s health has improved with treated bed nets. Last April, ChildFund workforce specialist Ann Latham-Anderson asked the children in her neighborhood an important question: If you didn’t have shoes, what would you miss most? Then she let them draw on her feet with magic markers, and her husband and daughter chipped in with drawings of children on her toes. The next day at work, she won our foot-decoration contest. “It did take a while to get the ink off my feet,” Ann says with a laugh. One Day Without Shoes, on April 16, is an engaging day at ChildFund’s international office in Richmond, with contests and music, but it also reminds us about the impact something simple like a pair of well-fitting shoes can have on children’s health, education and future opportunities. In developed countries, “we have so many options of what kind of shoes to wear,” says Sadye-Ann Henry, a treasury assistant who won the pedicure contest last year. One activity, walking on rocks, showed Sadye-Ann “how tender our tootsies are” and a glimpse of the challenges the children we serve face every day. Ann, Sadye-Ann and many more of us at ChildFund, including some of our national offices, are preparing to join in on One Day Without Shoes by going without shoes at the office. This event, started by TOMS Shoes six years ago, is meant to raise awareness about children’s education and health and how shoes play a role in helping create opportunities for a better future. Children in the countries ChildFund serves need shoes to stay healthy and attend school. In many developing countries that ChildFund serves, children must have uniforms and shoes to attend school. Also, when children have only flip-flops or no shoes at all, they’re vulnerable to cuts, diseases and hookworm infection, which have long-term implications like stunted growth and compromised health. Anyone can participate in One Day Without Shoes. Just kick off your shoes and join the rest of us in creating awareness of an important cause. Reflecting the fifth article of the Universal Declaration of Water Rights — ”Its protection is a vital need and a moral obligation of men to the present and future generations” — ChildFund Brasil strives to educate communities about water preservation for the benefit of future generations. The project “Meu Meio, Minha Vida” (My Surroundings, My Life), is part of the Vigilantes da Água (Water Watchers) program and is a result of the efforts invested in the communities of Vereda, Bidó, Pedra do Bolo, Tombo and Empoeira, in the Jequitinhonha Valley, a semi-arid region in the state of Minas Gerais in eastern Brazil. A group of water watchers in Brazil gather at a pond. ChildFund Brasil’s local partner organization, Municipal Community Association of Medina, carries out the program, which trains community leaders to monitor water quality and educate the community on advocating for their right to have access to clean water. Currently, 18 men and women monitor water quality, which benefits more than 200 families. One water watcher gets a sample. Paula Gava, coordinator at the Medina community association, notes, “The program is a way of working on environmental issues as a whole in the community, of making everyone reflect on the environment. At the moment, we discuss the situation of water availability. As the program continues, community groups are working with Minas Gerais’ rural extension agency and municipal health and agriculture departments to improve the quality of water.